In 1970's and early 80's I searched every early abandoned building I could find and rescued many items, documents, and letters of local historical interest. It is my pleasure to share some of them with you. I will be adding more as time permits. If you are interested in Fallbrook history, I encourage you to support the Fallbrook Historical Society with a membership and help preserve our rich heritage. 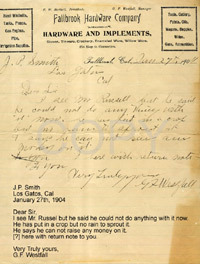 A 1904 letter from G.F. Westfall, proprietor of Fallbrook Hardware Co. to a Mr. J.P. Smith regarding a loan that was made to a Mr. Russell. 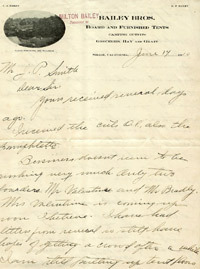 The letterhead shows Westfall as manager, but it is believed that by 1904 he had purchased the store. The promissory note accompanied the letter and is shown below. The Bailey family were early settlers to San Diego county and settled on Palomar mountain. This 1910 letterhead shows "Camp Contento" which was an early automobile camp. Bailey's General Store and Soda Fountain, the Palomar Post Office, a hand crank gas station and a dance hall building were all built and operated by the Bailey family. The resort and all the buildings are still in existence today. For more on the Bailey's and the resort, click here. 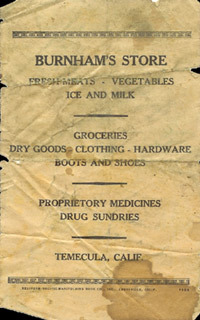 Burnham's Store was a fixture in Temecula for over 60 years. Built in 1891 from local bricks, the old building still stands and is currently the home of the Old Town Temecula Community Theater. 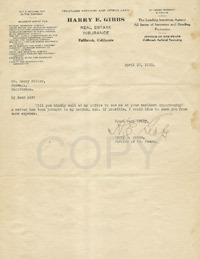 A 1930 letter from Harry E. Gibbs - insurance agent, real estate agent, and Fallbrook justice of the Peace. He was apparently a big promoter for Fallbrook with his letterhead advertising "Frostless Avocado and Citrus Land", "47 years without a Freeze" and "Not a Smudgepot in the District". The temperature must have dropped a few degrees since 1930, I guess. Does anyone remember Mr. Gibbs? 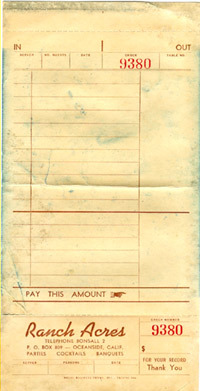 The partial remains of an early 1900's check from the "Citizens Commercial Bank" of Fallbrook. The name on the check reads "J.W. 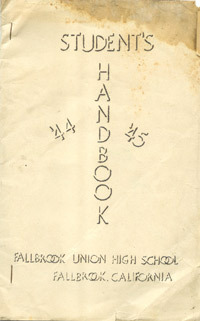 McCormick - Orchardist"
This is the cover of a complete student's handbook from the 1944-45 school year. It contains a second verse to the FUHS Alma Mater that I never knew existed. This is a 1914 letter from the Riverside County District Attorney to a Mr. Howard in Temecula discussing a water rights issue. This is a blank receipt from Ranch Acres in Bonsall. Ranch Acres is the large adobe building that stands on Hwy 76 in Bonsall, between downtown Bonsall and the West Bonsall bridge. It houses antique shops today. The building is rumored to have been built by the Ortega family (as in Ortega Chilies). In the 40's-60's it was a bar, restaurant, and some reports also say that the back rooms featured female "companionship". It was a popular stop along, what was then, a main highway between San Diego and points north. Notice the phone number. Does anyone have more information about Ranch Acres? Here's a photo that I found in an abandoned Fallbrook house in the 1970's. I don't know where the photo was taken or if it is even in Fallbrook. Anyone recognize anything? Circa 1950 metal ruler from Fallbrook Lumber Co.
1933 Prescription box with label from Keller's Rexall Pharmacy. 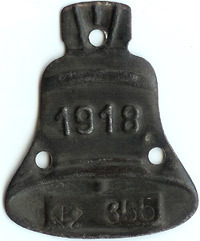 I found this 1918 metal automobile license plate piece in an old Fallbrook barn in the 1970's. It would have originally been attached to a leather license plate, I believe. More documents will be added as time permits, including a couple of FUHS graduation announcements from the 1930's.